Something Witchy This Way Comes is a great escapist read. Veronica Blade has an easy style that swiftly carries the reader from start to finish and lovers of romance will greatly appreciate the will-they-won’t-they tension between her two main characters. The novel is written using alternating first-person perspectives, meaning that readers are able to see into the minds (and motivations) of both Tessa and Hayden. The up-side of this is the fact that both characters end up being well fleshed out and three-dimensional. The down-side is that sometimes I ended up wanting to knock their heads together in the hope that they’d finally realise the information that I was already party to! I enjoyed the fact that, although Tessa is the good girl of the story, she is never presented as being a goody-goody. She makes mistakes, like most teenagers do, and she is happy to have fun and let loose every now and again. Ultimately, though, she is responsible and thoughtful and – most importantly – has the self-awareness and strength necessary to put her own needs before those of the boy she likes. In contrast, Hayden is represented as being the consummate bad boy, and lovers of his archetype should find plenty to smile about here, from his not-so-happy background right through to his begrudging attraction to Tessa. I have a feeling that Hayden is going to end up with a lot of fans, and if you’re the type of person who tends to fall for the bad boys with hearts of gold, you should probably brace yourself for a new literary crush before picking up Something Witchy This Way Comes! Together, the two main characters have great chemistry and, indeed, it is their budding romance that forms the centrepiece to this novel, not the paranormal aspect of the plot. I was a little disappointed by this, as I very much enjoyed each new revelation about the witches’ world and loved the tension of Tessa’s situation, but I know that there will be many other readers who will be pleased that the paranormal action doesn’t steal too much page-time away from the romance. I very much felt that Something Witchy This Way Comes is a romance lover’s romance. Often, a love plot will feel like it has only been added to a book to capture a larger audience. Here, however, there is a kind of gleeful focus on every moment of sexual tension between Hayden and Tessa. Something Witchy This Way Comes was a light and enjoyable read, which ably held my attention from start to finish. While I personally found myself wishing for a little more action and a little less romance, other readers will undoubtedly think the opposite. 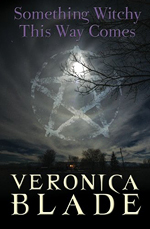 A promising debut from Veronica Blade.